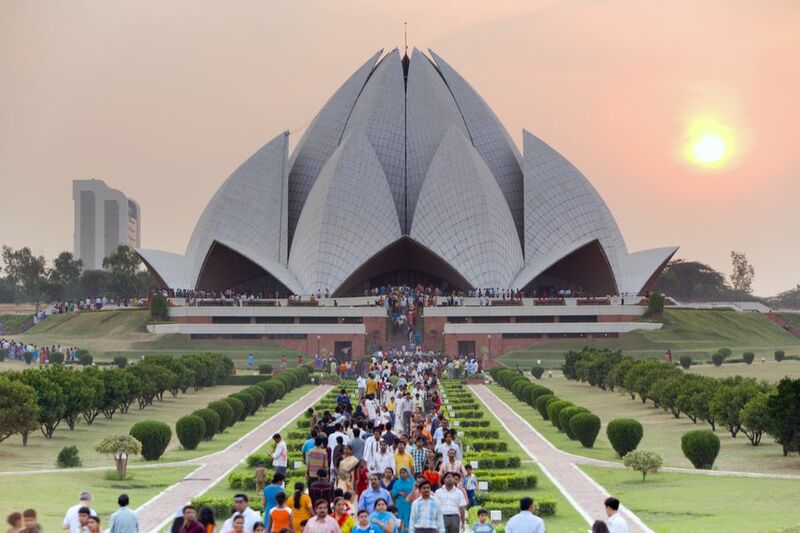 Delhi's distinctive Lotus Temple belongs to the Baha'í faith and is one of the city's top attractions. It's estimated that an average of 10,000 people visit the temple every day. Most come to admire its unusual architecture, resembling a floating lotus flower. The award-winning design has been widely acclaimed and featured in numerous publications, documentaries, and even on a postage stamp. The teachings of the Baha'í faith are also of interest to visitors. The religion, which originated in Iran, promotes oneness and aims to create world unity by eliminating all prejudices including race and gender. Read on to find out all you need to know about the Lotus Temple in this complete guide. The Baha'í faith is a relatively new religion that grew out of the Shi'ite branch of Islam in the mid 19th century. While Iran was experiencing widespread instability and turmoil, a 24-year-old merchant named Siyyid Ali Muhammad Shirazi claimed to be a messenger from God and a direct descendant of the prophet Muhammad. He called himself The Bab (The Gate) and started spreading a revolutionary message that paved the way for the foundation of the Baha'í faith. His main point was that a new prophet would appear after him to transform humanity. This contradicted a key a tenet of Islam, whereby Mohammad is the final prophet, and led to The Bab's execution in 1850. Subsequently, while persecuted and imprisoned, one of The Bab's followers had the revelation that he was the manifestation of God that The Bab talked about. He called himself Baha'u'llah (the Glory of God) and went on to write the scriptures that form the basis of the Baha'í faith. After he died in 1892, his eldest son Abdu'l-Baha became the interpreter of his teachings and served as the head of the religion until 1921. He was succeeded by his grandson, Shoghi Effendi, who became the Guardian of the Baha'í faith and helped spread it worldwide. By 2015, India had the world's largest population of Baha’i devotees, with 40% of the religion's 6 million followers living there. A goal of the Baha'í faith is to build Houses of Worship (Mashriqu'l-Adhkar) all over the world. These will be central to its community and activities but where everyone is welcome to come and connect to the divine regardless of religion. Although the Baha'í faith has its own scriptures, it believes that the religious teachings of all "prophets" (including Abraham, Moses, Jesus, Buddha, and Krishna) are valid and thus there is underlying unity of religions. The Lotus Temple in Delhi is one of eight Houses of Worship that currently exist, on every continent except Antarctica. The Baha'í community privately purchased the land for the Lotus Temple in 1953. Later, in 1976, its governing body chose renowned Iranian-born Canadian architect Fariborz Sahba to build the temple. Construction started in 1980 and the temple opened to the public in December 1986. The Lotus Temple is situated amid 26 acres of landscaped gardens on Lotus Temple Road in Bahapur, near Nehru Place, in south Delhi. It's 30-45 minutes from the city center. The closest Metro train station is Kalkaji Mandir on the Violet Line (see Delhi Metro train map), a five minute walk away. The temple complex is open daily, except Mondays, from 9:30 a.m. to sunset. It closes at 5:30 p.m. during winter, from October until the end of March. In summer, from April to the end of September, it stays open until 7 p.m.
Everyone is welcome to visit the Lotus Temple. There's no cost to do so and donations are not required. However, the temple's growing popularity as a tourist attraction means it does get very crowded! This is the case particularly on weekends and national holidays. When it's busy, you can expect to wait in line for an hour (or more) to go inside the Prayer Hall. Therefore, if you're not intending to meditate or pray, you may want to skip it. The interior is notably plain and unadorned, without altars or religious idols, and photography isn't allowed. A paved pathway will take you from the main gate of the temple complex to the base of the temple. You'll need to remove your shoes there and carry them in the bag provided. Follow the flight of stairs up to the platform, from where you can enter the Prayer Hall. Volunteers will guide you inside and provide a brief overview of the Baha’i faith. Short prayer services, involving the chanting or reading of prayers from various religions, are held periodically throughout the day at 10 a.m., noon, 3 p.m. and 5 p.m. Other than this, there are no religious sermons or rituals, and visitors must remain silent while in the hall. It's a serene experience. Upon leaving the Prayer Hall, collect a free pass to the Information Center and stop by it on the way back to the parking lot. Do note that children under the age of 12 aren't permitted to enter. If you think the Lotus Temple looks similar to the iconic Opera House in Sydney, Australia, you're not alone! It's an extremely common observation. Yet, unlike the Opera House, the outer shells of the temple form the petals of a lotus. There are 27 of these "petals", made out of concrete and covered in marble pieces. The lotus design was chosen because of its symbolic importance to many world religions, including Jainism, Buddhism, Hinduism and Islam. In accordance with Baha’i scriptures, the Lotus Temple is a circular shape with nine sides and nine entrances. The Baha’i faith reveres the mystical properties of the number nine (nine is associated with perfection because it's the highest single number. It's also the numerical value of Baha in the Arabic alphabet). The temple is encircled by nine ponds as well. You'll be able to see them after climbing the stairs at the base. Many visitors agree that the temple's beauty is best appreciated from the outside due to the stark interior of the Prayer Hall. However, what's remarkable about this cavernous white enclosure is that it has no pillars or beams. There is seating for up to 2,500 people and a glass roof that lets in natural light. The temple is particularly captivating at sunset, when its exterior is evocatively illuminated. Those who are curious about the Baha’i faith and Lotus Temple can learn a lot from the educational exhibits at the expansive Information Center. This building, which opened in 2003, was specially designed by the temple's architect to address the many questions visitors have. It's like a museum and it's worth spending some time there to gain a deeper understanding of the religion. In addition to the photos and text that are on display, insightful short films are screened every 20-30 minutes. The Lotus Temple is ideally visited along with other attractions in south Delhi. Trendy Hauz Khas urban village is one of Delhi's cool neighborhoods, and is a popular place to eat and drink. Its modernity contrasts with some fascinating medieval ruins dating back to the 13th century. Dilli Haat is a famous tourist market where artisans come and sell their wares. It also has cultural performances and Indian cuisine from various states. If you're keen on shopping, there are other top local markets in the area. Head to Nehru Place for electronics, Sarojini Nagar for designer export surplus clothes, and Lajpat Nagar for inexpensive Indian clothes or to get mehendi (henna) applied to your hands. Further south in Mehrauli, Qutub Minar is the tallest brick minaret in the world and a 13th century UNESCO World Heritage Site. There are hundreds of monuments from the 10th century to the British era dotted throughout the forest at sprawling 200-acre Mehrauli Archeological Park, adjacent. Nearby Dastkar Nature Bazaar is one of the best places in Delhi to buy unique handicrafts. North of the Lotus Temple are Humayun’s Tomb and Lodhi Colony (where you can check out the funky street art). Love fine dining? Have a meal at award-winning Indian Accent, which recently relocated to The Lodhi boutique hotel.